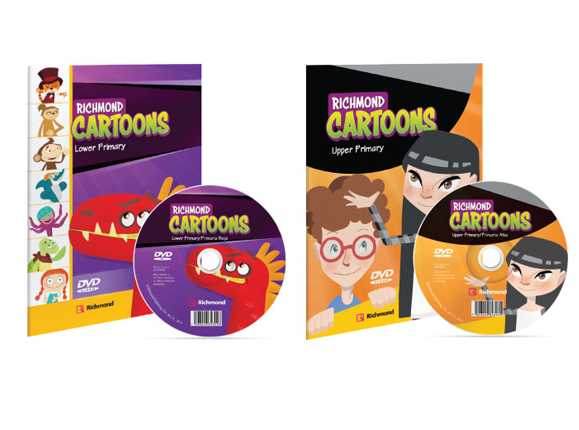 The adventures of the Richmond Cartoons friends bring English to young learners in this original series of fully animated videos. Created to fit language objectives for learners in primary, the cartoons can be used as a complement to any course or just for fun! Illustrated language activity worksheets for each video are included. Teachers can boost students’ skills through the Reading/Writing, Listening and Speaking exercises created for each video. The activities follow Cambridge Young Learners and TOEFL Primary® exam models to give students extra preparation practice. Watch 12 entertaining animated adventures. Follow sea creatures, jungle animals, talking toys and dragons. Explore the ocean and jungle, the circus and a castle in the sky. Help children better interpret visual media and text. Introduce issues such as family relationships, healthy habits and protecting the planet. Develop multiple intelligences—visual/spatial, verbal/linguistic, interpersonal and intrapersonal. Increase awareness and practice of fundamental values, including friendship, honesty and respect. Learn everyday English to express preferences, give directions or commands, learn manners and talk about routines. Make use of a bilingual manual created for teachers and parents to use in school and at home. Prepare students for Cambridge Young Learners (Starters, Movers and Flyers) and Step 1 and Step 2 of the TOEFL Primary® Exam.